Pesky pooch: This dog pinches things from all over the house! 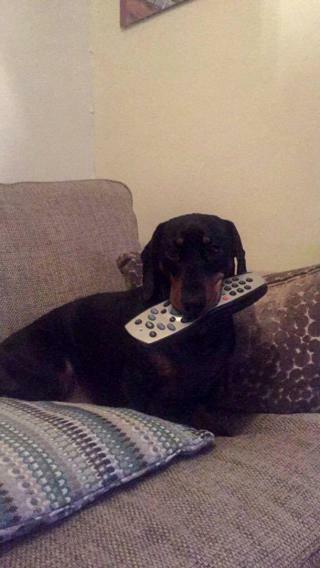 One naughty pooch has become a bit of an internet sensation recently after his owner posted pictures of him stealing items from around the house. Meet Flynn. 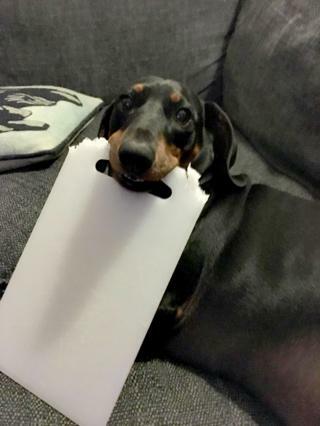 He is a four-and-a-half-year-old Dachshund - and he has a cheeky habit that his owner has shared with the internet. Flynn likes to steal items from around the house. Yep, you heard us. 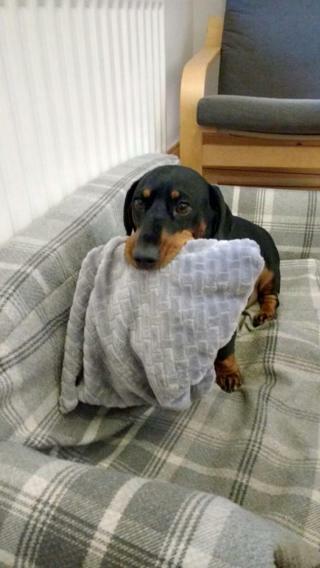 This dog is a cheeky common thief! 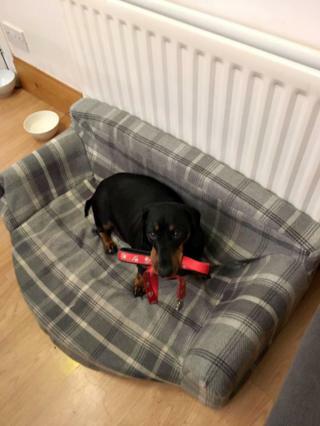 Newsround caught up with his owner Francesca, after she posted a series of pictures on social media of her adorable pooch proudly showing off his latest pickings. "He has always stolen things, especially as a puppy, but he never seemed to grow out of it," she told us. "As you can see, his favourite items are kitchen items. 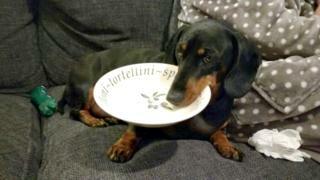 He will sneak up on my mum while she's emptying the dishwasher and grab anything he can get." 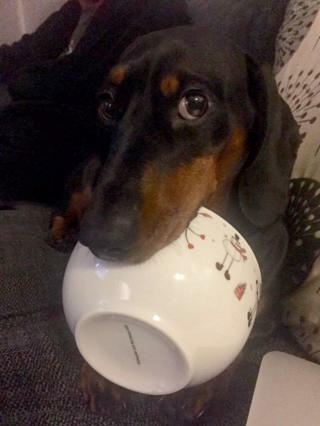 "He has had everything from forks to spoons, plates and bowls, and even tries his luck with my mum's glasses from time to time." We suppose you can never be too ready for your next meal, eh Flynn? "The weirdest thing he has stolen would probably be the candle. We just could not work out how he managed to grab that and why he would in the first place, but he finds it very amusing to say the least." Look at that face! 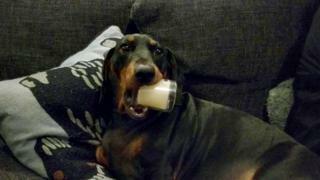 Why would you want that candle in your mouth?! Just...why?! 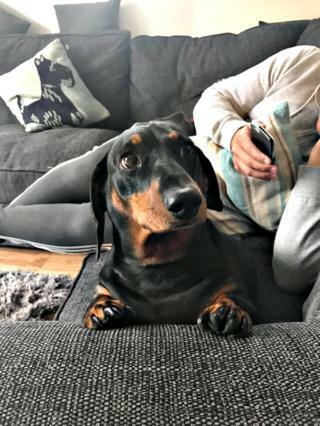 "Whenever he steals something he slowly walks through the kitchen up and down until he gets noticed and we always have to trade the item for a treat for him to drop it - I think that's part of the appeal!" It certainly sounds like an extremely cunning way to be fed more treats. Needless to say, Flynn's thieving ways only make Francesca even fonder of him. "I honestly think he's one of a kind," she says. And with a face like that? Who can blame her! Even though it must mean losing crockery all the time, we'd have him to stay with us ANY day of the week.